You'll fall in love with the views from this single story home on a desert view lot. The curb appeal & courtyard entry set the tone for the beautiful great room floorplan. The kitchen features granite counters, upgraded backsplash, 6 burner gas stove, alderwood cabinets, walk-in pantry & large island with breakfast bar. The split master suite boasts sitting area, huge walk-in closet, upgraded wood shutters & upgraded bathroom! The split guest bedrooms all have a full bath nearby. Adding to the home's ambiance is recessed & designer lighting throughout. 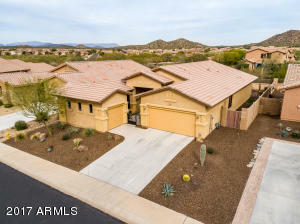 The back yard is perfection with pool & water features, travertine decking, covered patio, fantastic privacy & those mountain and desert views that surround you. All that plus this home is meticulously maintained. Perfection inside & out! Directions: Start From 67th ave & happy valley. From there, go North on 67th which turns into pyramid peak pkwy to end. Left at sonoran mtn rd. Left at chaflen blvd. Left at 70th ln. Left at minor trail; right at 70th st. Home on left.